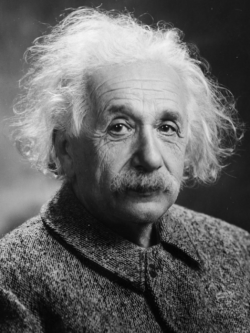 Albert Einstein won the 1921 Nobel Prize in Physics “for his services to theoretical physics, and especially for his discovery of the law of the photoelectric effect.” He was born in the German Empire in 1879. He was a U.S. citizen from 1940 until his death in 1955. Willard Boyle shared the 2009 Nobel Prize in Physics “for the invention of an imaging semiconductor circuit – the CCD sensor.” Born in Nova Scotia in 1924, Boyle moved to the U.S. to join Bell Labs in 1953. Ranier Weiss won the 2017 Nobel Prize in Physics “for decisive contributions to the LIGO detector and the observation of gravitational waves.” Born in Berlin, Germany in 1932, Weiss and his family escaped Nazi rule with the help of the Stix Family of St. Louis. He received his degrees from MIT and joined the faculty there in 1964. Charles Kao shared the 2009 Nobel Prize in Physics “for groundbreaking achievements concerning the transmission of light in fibers for optical communication.” Born in Hong Kong, Kao is a naturalized citizen of both the U.S. and the U.K.
Eugene Wigner shared the 1963 Nobel Prize in Physics “for his contributions to the theory of the atomic nucleus and the elementary particles, particularly through the discovery and application of fundamental symmetry principles.” He was born in Budapest, Austria-Hungary in 1902. He came to the U.S. in 1930 for a one-year lectureship at Princeton. He later moved on to the University of Wisconsin, where he became a naturalized U.S. citizen in 1937. 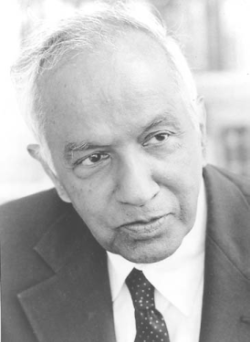 Subrahmanyan Chandrasekhar shared the 1983 Nobel Prize in Physics for “theoretical studies of the physical processes of importance to the structure and evolution of the stars.” Born into a Hindu family Lahore in what was then British India (today’s Pakistan), Chandrasekhar received a PhD from Cambridge University in 1933. He came to the U.S. after being recruited by the University of Chicago. Emilio Gino Segrè shared the 1959 prize for his work in the discovery of the antiproton. Born in Italy, he emigrated to the U.S. to escape Mussolini’s fascist government, which had barred Jews from university posts. Enrico Fermi won the 1938 Nobel Prize in Physics “”for his demonstrations of the existence of new radioactive elements produced by neutron irradiation, and for his related discovery of nuclear reactions brought about by slow neutrons.” The Italian-born Fermi became a U.S. citizen in 1944 and played an important process in the Manhattan Project. Riccardo Giacconi won the 2002 prize “for pioneering contributions to astrophysics, which have led to the discovery of cosmic X-ray sources.” He was born in Italy and came to the U.S in 1956 on a Fulbright Fellowship. 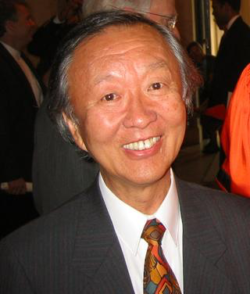 Yoichiro Nambu won the 2008 Nobel Prize in Physics “for the discovery of the mechanism of spontaneous broken symmetry in subatomic physics.” He was born in Japan and came to the U.S. in 1952. Shuji Nakamura won the 2014 prize “for the invention of efficient blue light-emitting diodes which has enabled bright and energy-saving white light sources.” He was born in Japan byt has been a U.S. citizen since 2000. Nicolaas Bloembergen shared the 1981 Nobel Prize in Physics for his work in the development of laser spectroscopy. Born in the Netherlands, he came to the U.S. in 1945 to study at Harvard. Daniel C. Tsui shared the 1998 prize for his co-discovery of a new form of quantum fluid. He was born in China and came to the U.S. for college in 1958. Alexei Alexeyevich Abrikosov was awarded the 2003 prize “for pioneering contributions to the theory of superconductors and superfluids.” Born in the Soviet Union, he came to the U.S. in 1991. Felix Bloch shared the 1952 Nobel Prize in Physics for “development of new ways and methods for nuclear magnetic precision measurements.” He was born in Switzerland but moved to the U.S. in 1934 to accept a faculty position at Stanford. Anthony James Leggett won the prize in 2003 “for pioneering contributions to the theory of superconductors and superfluids.” He was born in London and has taught at the University of Illinois since 1983. David J. Thouless was awarded the prize in 2016 “for theoretical discoveries of topological phase transitions and topological phases of matter.” He was born in Scotland and came to the U.S. to obtain his Ph.D. at Cornell University. Duncan Haldane shared the 2016 prize “for theoretical discoveries of topological phase transitions and topological phases of matter.” He was born in London and took a faculty position at the University of Southern California in 1981. J. Michael Kosterlitz shared the 2016 prize “for theoretical discoveries of topological phase transitions and topological phases of matter.” He was born in Scotland and has been a professor at Brown University since 1982. Otto Stern was awarded the 1943 prize “for his contribution to the development of the molecular ray method and his discovery of the magnetic moment of the proton.” He was born in Sohrau, Prussia (today in Poland). He came to the U.S. to work at the Carnegie Institute of Technology and later taught at Berkeley. Maria Goeppert-Mayer shared the 1963 Nobel Prize in Physics for “discoveries concerning nuclear shell structure.” She was born in what is now Poland and moved to the U.S. in the 1930s. Hans Bethe won the 1967 prize for his work on stellar nucleosynthesis. He was born in Strasbourg, Germany, but worked at the Los Alamos laboratory during World War II, where he played a key role in the development of the atomic bomb. Arno Allan Penzias shared the 1978 prize for his role in the discovery of cosmic microwave background radiation. He was born in Munich, Germany and came to the U.S. with his family, who had fled the Nazis, in 1940. Jack Steinberger won the 1988 prize “for the neutrino beam method and the demonstration of the doublet structure of the leptons through the discovery of the muon neutrino.” He was born in Germany but came to the U.S. at age 13. Polykarp Kusch won the 1955 prize “for his precision determination of the magnetic moment of the electron.” He was born in Germany in 1905 but came to the U.S. in the late 1920s to study at Case Western Reserve University. Hans Georg Dehmelt won the 1989 prize for co-developing the ion trap technique. He was born in Germany in 1922 and came to the U.S. in 1952 to take a postdoctoral position at Duke. Ivar Giaever shared the 1973 prize “experimental discoveries regarding tunneling phenomena.” He was born in Norway and moved to the U.S. in the late 1950s. Albert A. Michelson won the 1907 Nobel Prize in Physics “for his optical precision instruments and the spectroscopic and metrologicalinvestigations carried out with their aid.” He was born in Prussia (modern-day Poland) in 1852 but immigrated to the U.S. with his family in 1955. He was the first American to win a Nobel Prize in a science. Isidor Isaac Rabi won the prize in 1944 “for his resonance method for recording the magnetic properties of atomic nuclei.” Born in Austria-Hungary (now Poland), Rabi came to the U.S. as an infant.